Good weekend at the thrifts this past weekend. Among the treasures were a McCoy swan art deco flower holde (aqua) and a set of 4 Mottahedeh “Chelsea Birds” salad plate. From Erphila Art Pottery comes this very colorful “biscuit jar with lid” in the classic brilliant orange-red POPPY pattern. I love this pattern, because the intensity of the color is so rich, simple, and pleasing. This particular shape (not in Poppy) is identified on pages 145 (picture 1510) and 203 (description) of the reference guide, “Czechoslovakia Pottery: ‘Czeching’ Out America'” (by Bowers, Closser, & Ellis). They describe Erphila as “an import company owned by Ebeling and Reuss of Philadelphia, Pennsylvania. The company imported high-quality pottery from many factories in Czechoslovakia, operating from approximately 1920 to 1940” (page 34). This lovely hand-painted jar measures about 7.5 inches high (top of the lid handle), 5.75 inches high at the rim, 4 inches wide across the rim, and 4 inches wide across the foot. I think this particular shape is especially nice because of the recessed corners and the knobby handles. The jar is in good condition. There is a lot of wear to the top orange rim (especially on one side), and one shallow chip (flake) on the orange trim at the foot. The inside rim has no chips or cracks or hairlines. There is overall even crazing (not too heavy, but visible); the crazing has begun to brown on the inside bottom of the jar (but not on the outside). The lid has two chips on the inside bottom edge, and a bit of wear to the orange trim. There are no cracks. The wicker handle is intact, with just a little loosening in the wrapping on one side. I’m always amazed at what I find in the thrift stores. A wonderfully designed very elegant covered bowl with lid and underplate, marked “Lowestoft Reproduction / Created by Mottahedeh.” I believe this is a Chinese Export design (based on pieces imported in the early 1800s) in an Adams style, with a pale blue body heavily decorated with a Chinoiserie design of thick gold (gilt) on dark blue, with handles like branches and a large acorn handle on top. It probably dates to the 1950s (my best guess). All three parts are in very good to excellent condition (no chips, cracks, or crazing; no wear). The bowl measures 8 inches wide across the handles, 5.5 inches by 4 inches at the rim, 4 inches by 2.75 inches across the foot, and 3.5 inches high with the lid. With the lid in place, the bowl measures 6.5 inches high. The underplate is 8.25 inches by 6-3/8 inches. Both sides of the bowl and the center of the underplate are decorated with American-like eagle, with 13 stars and a blue banner in the eagle’s mouth. The bottom of the underplate has a blue mark for “Lowestoft Reproduction / Created by Mottahedeh,” along with a hand-written number 575-AB, and remnants of paper labels; there is also an incised “H” (I think a decorator mark). The bowl has the same blue hand-written mark, the black number, and a partial round label for Mottahedeh. On the interior base of the bowl is a gold number 8, and the lid has a number 3. According to Wikipedia, “Mottahedeh is the recognized leader in antique reproductions and adaptations in luxury ceramics, primarily hard porcelain, and metals. 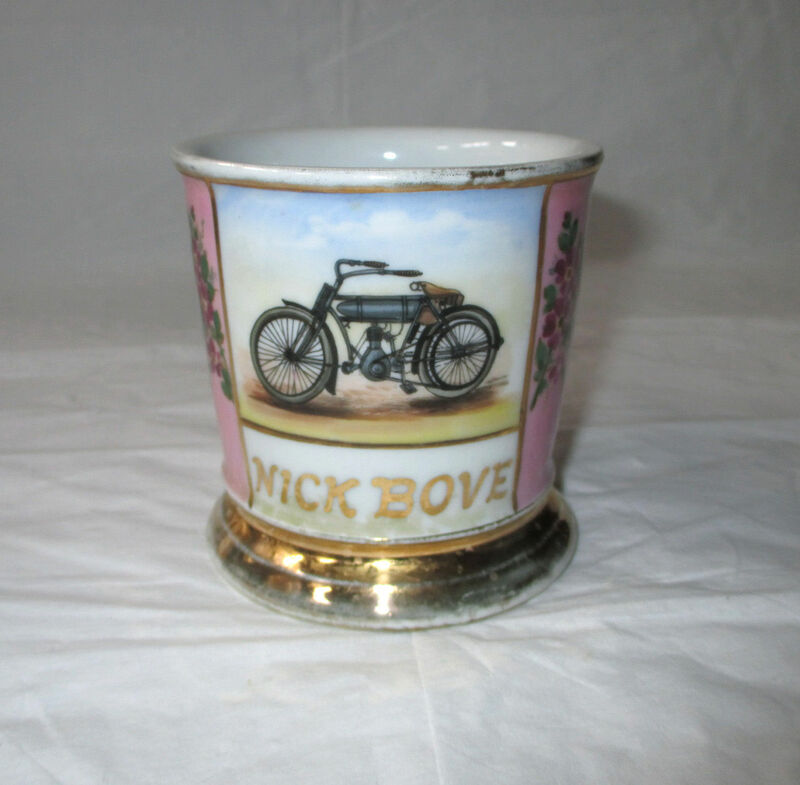 It specializes in Chinese Export porcelain and early European porcelain.” Sold on eBay for a bit over $200. I love this plate. Eckhart Hall is about 2 blocks from my house, and is famed for housing the great minds behind the Manhattan Project. It looks as beautiful today as it did in 1931. But the trees are much larger! 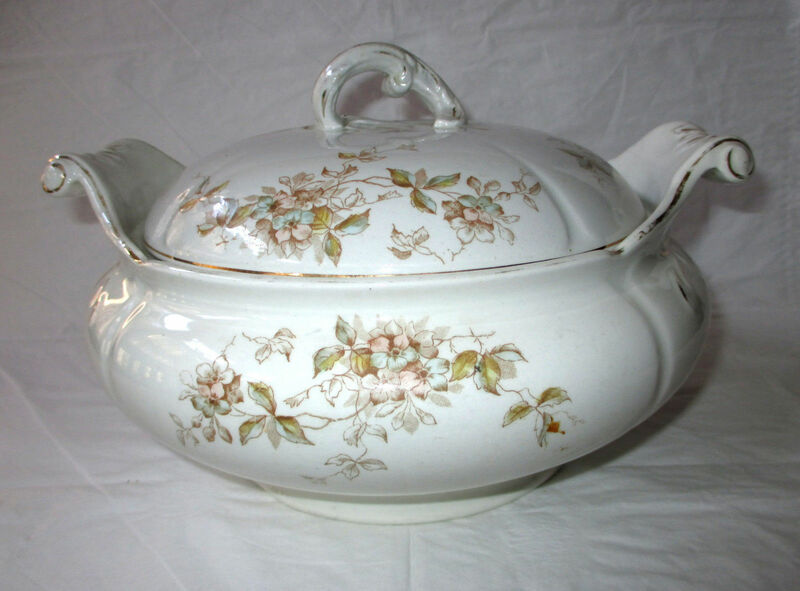 An antique covered transferware soup tureen or vegetable bowl, richly decorated in pink and green flowers and gold trim. It is marked T & R Boote (Burslem, England). The bowl has the registry number 185168 (I believe), which dates it to about 1892 (see thepotteries.org). The heavy round bowl measures 10.25 inches wide across the scrolled handles and about 8.5 inches wide across the lip of the rim. With the lid on, the piece measures about 6.5 inches high, or 4.25 inches to the top of the rim. The lid has a cutout on one side, for a spoon or ladle, which is why I believe it would be considered a tureen. This piece is in very good condition, especially for its age. The only flaw that I can see are several brown spots on the inside base (see closeup photos). There is a lot of wear to the gold trim, particularly on the handles, rim, and lid handle. The bowl is structurally very sound, with no chips, cracks, hairlines, crazing, or fleabites. On the bottom is a very clear crown and shield mark for Waterloo Potteries / Trade Mark / Royal Premium /Semi-Porcelain / T & R Boote / England / Rd 185168. It’s very rare that I find something “special” like Roseville in the thrift stores. Imagine how shocked I was to find a PAIR of Roseville Pinecone basket vases, in perfect condition, for $4.99 each! Egads! For now, they’re staying in the personal collection. They’re too lovely to let go just yet. But maybe, in a few months…. This is an intense art pottery vase–better than my photos make it look. 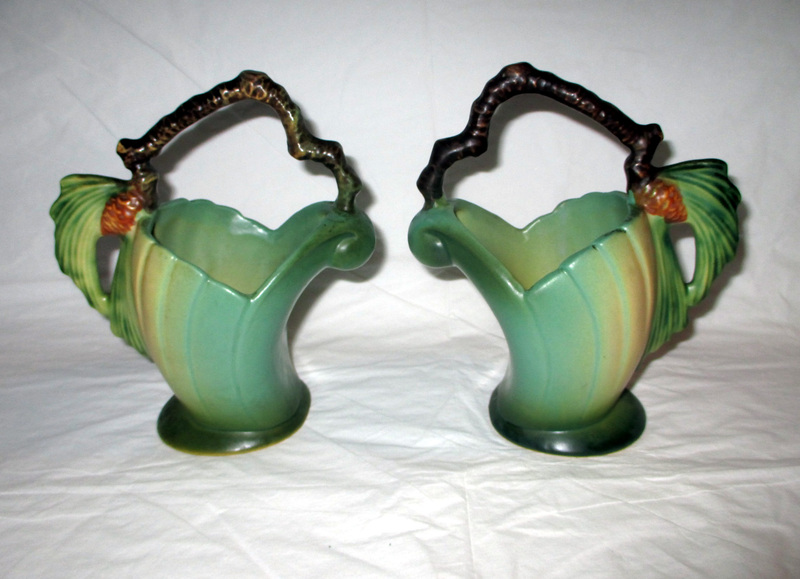 It is heavily decorated on both sides, and has a lovely dark-to-light green glaze. The top has 5 rings for holding flowers (I assume). 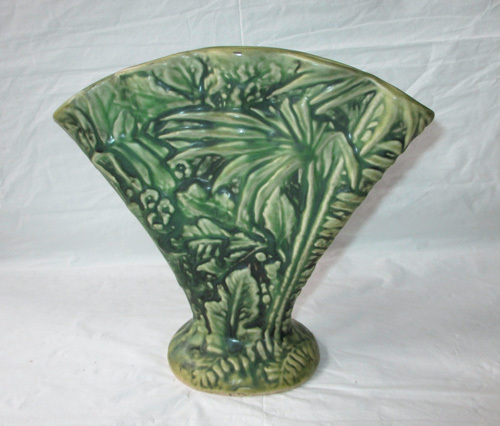 This vase is 8 inches high at the rim, 8 inches wide across the rim, and 1.75 inches deep at the rim. The foot is about 4 inches by 3.5 inches. It is in very good to excellent condition, with no signs I can see of chips, cracks, fleabites, or other flaws. There is light overall crazing. It’s really quite a stunner. 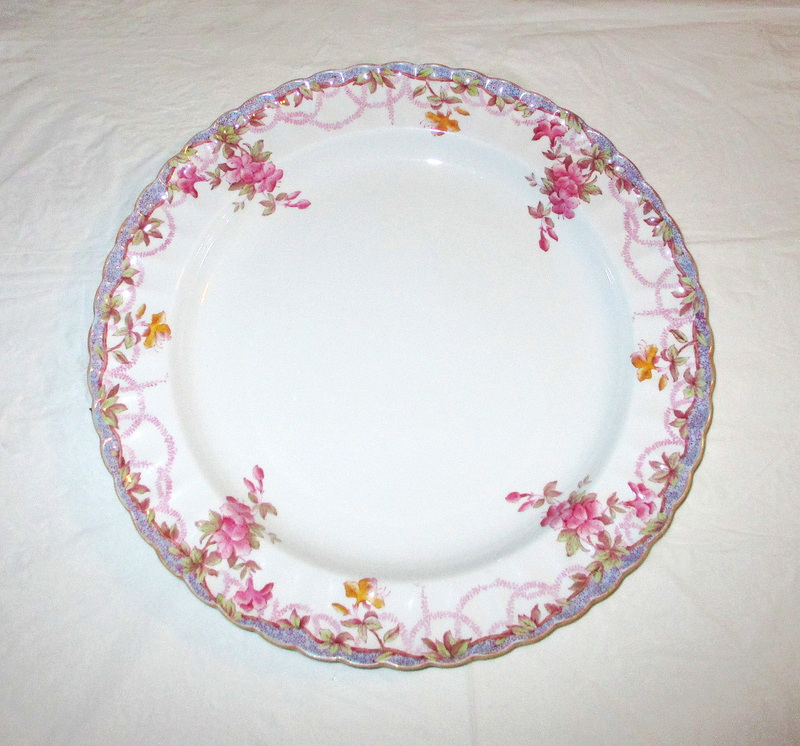 This listing is for a magnificent Copeland Spode round platter (or huge chop plate) in a pattern called “Irene.” It is decorated with dark pink flowers and garlands, with smaller yellow flowers, a blue border, and yellow trim around the scalloped rim. 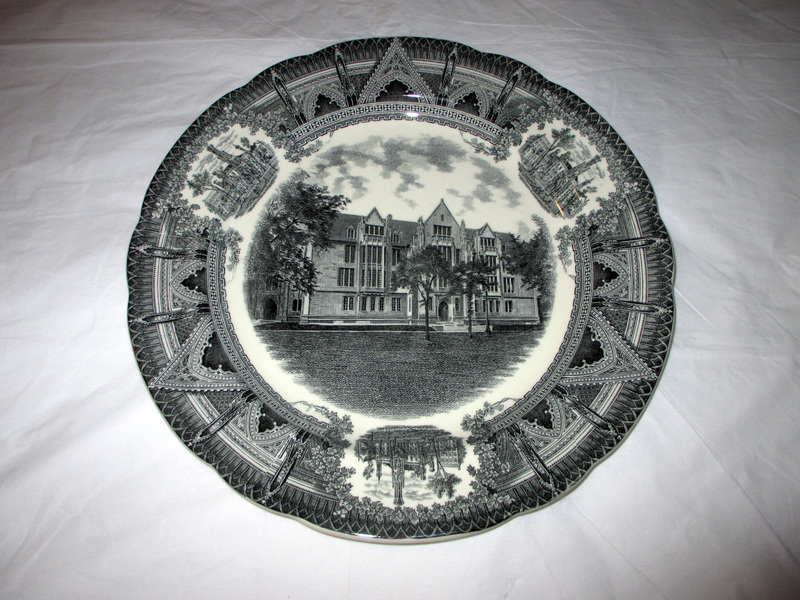 The platter measures 14-7/8 inches wide across the rim. This piece is in good to very good condition. There are no chips, cracks, or crazing. There are visible utensil marks when the platter is held to the light at an angle; none of the utensil scratches mar the design or can be seen when the piece is sitting flat. Manufacturer Status: Discontinued Actual: 1953 – 1971.